Bit of a classic read this month. 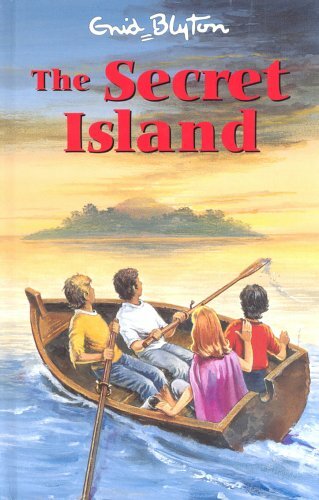 The Secret Island by Enid Blyton has got to be up there as one of my favourite childhood books. When I hit my teens, I sadly got rid of a lot of books I had - Secret Seven's; Famous Five; Mallory Towers; Trebizon; Babysitters Club (remember any of these?) and although I don't really have the space I massively regret this, and I'm slowly trying to re-build some of these collections. One of my favourites was Enid Blyton's 'The Secret Series." It's typical Blyton fare, full of "gollys" and "gosh" and 'lashing's of ginger beer'; (did you know that the phrase lashings of ginger beer was never actually said in a Famous Five book; it actually came from the satirical Comic Strip Presents......Five Go Mad in Dorset)and the usual girls making house, boys doing boy-type things but I can easily get past all that by accepting that was how genders were perceived at that time. I think the reason I like this book so much, is the whole practicality side of things - they literally think of everything and anything they might need - including a cow and some chickens for fresh eggs and milk (obviously!). The fact that they manage to avid by found for so long (the book implies months) could only happen in an Enid Blyton book, and the ending is just as typical, but do you know what, that's exactly why I love it. Oh my goodness! I couldn't believe it when I saw this post, - only yesterday I finished reading a Secret Seven book by Enid Blyton! I recently read an article about revisiting childhood stories which made me purchase a copy of The Secret Seven. I had truly forgotten how wonderful Enid Blyton' s stories are! It was refreshing to read a book full of innocence and just some good old adventure with the odd jug of homemade lemonade thrown in. I've not heard of The Secret Island by Enid Blyton but may have to track it down for a read. I used to have the ENTIRE Baby Sitter club series, but when I stopped reading them and didn't care, my mom got rid of them. Hate myself for letting her do that now. That's an interesting book. I would love to read it once I'm done with The Little White Horse (I saw a film adaptation of the book and it totally got me so interested).